Today’s winter warming Foodie Friday recipe combines the sweetness of warm baked pears with root vegetables. Enjoy as a meal in itself with a little of your favourite cheese on top (blue cheese is delicious with this!) or, serve as a tasty side salad at dinner. Trim and wash each beetroot and wrap in foil. Place in oven. Halve tomatoes horizontally and place in a small baking try. Sprinkle with sugar, chilli, salt and pepper. Drizzle with a couple of teaspoons of olive oil. Cut pears and remaining vegetables into wedges and combine in a large roasting dish. Toss with salt and pepper and remaining olive oil. Roast in same oven for 30 minutes. Add spinach on top of vegetables and cook another 5-10 minutes or until wilted. Peel beetroot and cut into wedges. Toss all vegetables together in a large serving bowl and scatter with cheese. It’s freezing in the Adelaide Hills today, with snow forecast for some parts of the state! With that in mind, today’s Foodie Friday is warm and delicious, and of course simple to make. You can pick up the pear juice and pears from Paracombe Premium Perry at a market stall near you! Combine pear nectar or juice, cinnamon sticks, cloves and anise stars in a medium saucepan. Bring to a boil, then reduce heat and simmer for 10 to 15 minutes. Add tequila and stir to incorporate. 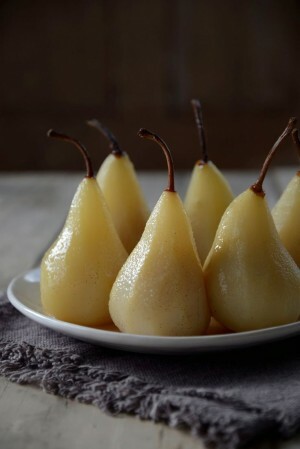 Cut off the pear tops and with a sharp knife, carefully outline a rim on your pear cups. With a melon baller or spoon, hollow out the pears, making sure to leave about 1/4 inch at the bottom and around the edges, creating a cup. 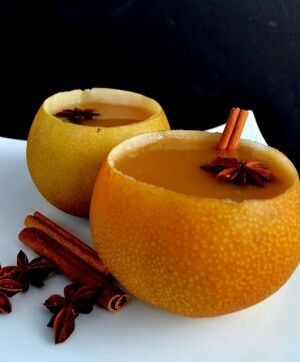 Pour warm nectar into pear cups and enjoy! 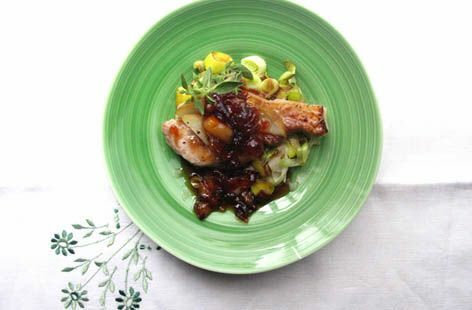 Paracombe Premium Perry shares a simple easy peasy ‘Perry Pork’ recipe this Foodie Friday, which is, as the name suggests, easy to make for friends and family and uses a bottle of Paracombe Premium Perry too! Add the pork loin steaks to a deep oven dish, along with one peeled and cut pear and pour half of the bottle of the Paracombe Premium Perry in, so the steaks are covered. Sprinkle 25g of brown sugar on top. Cook for 30 minutes. In the mean time, chop the onion and one pear (skin off) and add to a warm frying pan containing the olive oil. Once the onion has started to sizzle, add 75g brown sugar and the water. Turn the heat down and allow to cook for 10 to 15 minutes. After 30 minutes in the oven, take the pork out and turn over. Add the caramalised onion & pear slices and put back in the oven for 15 minutes. Sit back and relax for 15 minutes with the rest of the Paracombe Premium Perry! Check pork is thoroughly cooked before serving with thick cut potato chips, or whatever takes your fancy. 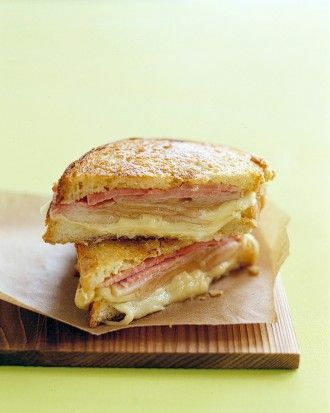 This Foodie Friday we’re putting a spin on an old favourite – Grilled Ham & Cheese! Adding fruit makes it healthy right? So we’re proposing the grilled ham & cheese sandwich with pear! It may seem like a strange combination at first, but trust us – the salty taste of the cheese and ham combined with the sweet taste of the pear is a match made in heaven! Layer 4 slices of sandwich bread with about 250 grams of melting cheese, 1 thinly sliced pear, and 250 grams of thinly sliced deli ham; top each with bread. Heat a large fry pan over medium heat. Spread the outside of both bread slices with butter. Cook sandwiches in batches (if necessary) until golden and cheese is melted, flipping once, 3 to 5 minutes per side. Cut sandwiches in half and serve hot. 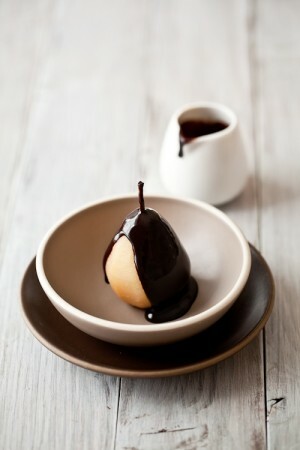 There’s only one thing to do on Foodie Friday on the Easter long weekend, cook pears with chocolate! This quick and easy recipe is in-season, delicious, and perfect for your Easter celebrations! In a small saucepan, bring the water, caster sugar and cinnamon to the boil. Peel the pears, leaving the stems intact. Place the pears in the sugar syrup, return to the boil and immediately remove from the heat and set aside to cool. The remaining heat will continue to cook the pear. In a small pan, heat the cream, cinnamon and butter and remove from the heat just before it boils. Whisk in the dark chocolate and Frangelico until the chocolate is entirely melted and you have chocolate sauce. Serve one pear per guest with the chocolate sauce drizzled over the top. Pears are in season and the nights are getting colder! This recipe is warm, delicious, quick to prepare and a great way to get the family to eat a piece of fruit – happy Foodie Friday! Preheat the oven to 180° and line a baking tray with baking paper. 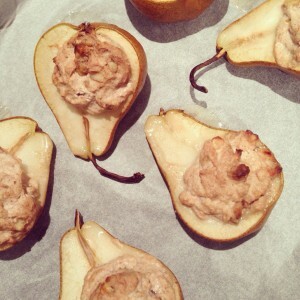 Scoop out the seeds of the pears, leaving a small hole that can be stuffed with the ricotta mixture. Combine the ricotta, walnuts and cinnamon. Spoon the ricotta mixture into the pear hollows. Place on the baking tray and bake for 30-40 minutes or until the pears are tender. 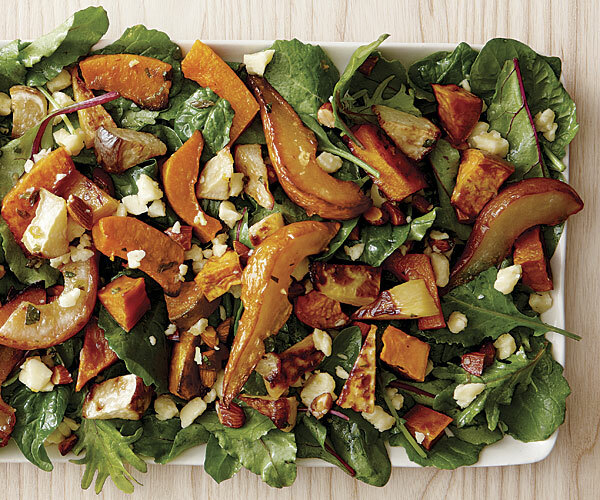 Foodie Friday is here, and with it, the recipe for this delicious Autumn pear salad! Pick up some fresh, juicy pears from us at the market this weekend and enjoy! See our web calendar for market dates. To a blender add olive oil, balsamic vinegar, honey, dijon mustard, diced shallot and season with salt and pepper to taste. Blend mixture until well emulsified, about 20 seconds. Store in refrigerator in an airtight container until ready to serve. In a medium skillet melt butter along with brown sugar over medium heat. Once mixture has melted add walnuts and cook, stirring constantly until caramelized, about 2 minutes. Transfer to a plate in a single layer to cool. 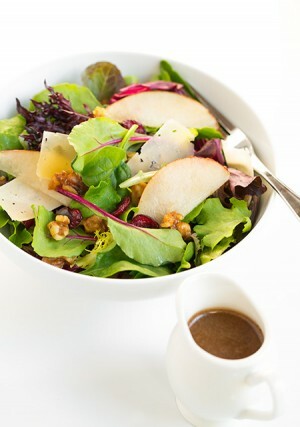 Layer lettuce and pears in a large bowl and toss with dressing, then top with parmesan, dried cranberries and candied pecans and serve. Note: top this salad with dressing just before serving, as it will wilt the lettuce after a while. Autumn has arrived in Australia and our 2015 harvest is complete! With so many fresh, delicious pears now available, we’ll be bringing you our favourite pear recipes on ‘Foodie Friday’, starting with this weeks’ pears poached in Riesling and vanilla – a perfect autumn dessert. Put all ingredients except the pears in a big wide pot and bring to a boil stirring for a few minutes to dissolve the sugar, then reduce to a simmer. Carefully peel your pears then put all together into the simmering liquid. If the pears are not fully covered, add equal quantities of water and wine to cover. Leave to cook for about 10 minutes if you have ripe pears, or 20 minutes for almost ripe pears. The point of a knife will pierce the pear easily into soft flesh once done. Carefully remove the cooked pears with a slotted spoon and put into a container, standing upright. Next boil the poaching liquid for 30 – 45 minutes until it is reduced to an aromatic syrup. Serve warm or cold with whipped vanilla cream – add 1 tsp vanilla paste and 1 tbsp icing sugar to 300 ml softly whipped cream and/or vanilla bean ice cream. Happy New Year Perry lovers! There’s no doubt you all spent the Holiday Season over-indulging in all things delicious, so for our first Friday Shake Up for 2015 we’re bringing you a detox juice! 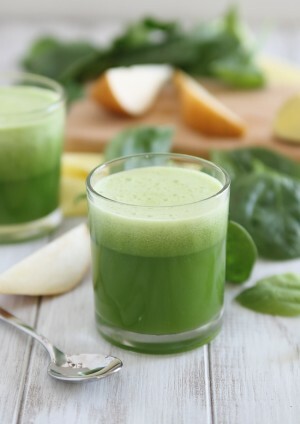 This delicious detoxifying pear, ginger and spinach green juice is perfect for the morning after, so you can get stuck into 2015 minus the hangover! Add all the ingredients to a juicer or blender and combine until desired consistency is achieved. Stir then divide evenly between two glasses. Now that Santa’s left town it’s time to party, and if there’s one day to do a beverage right it’s New Year’s Eve! 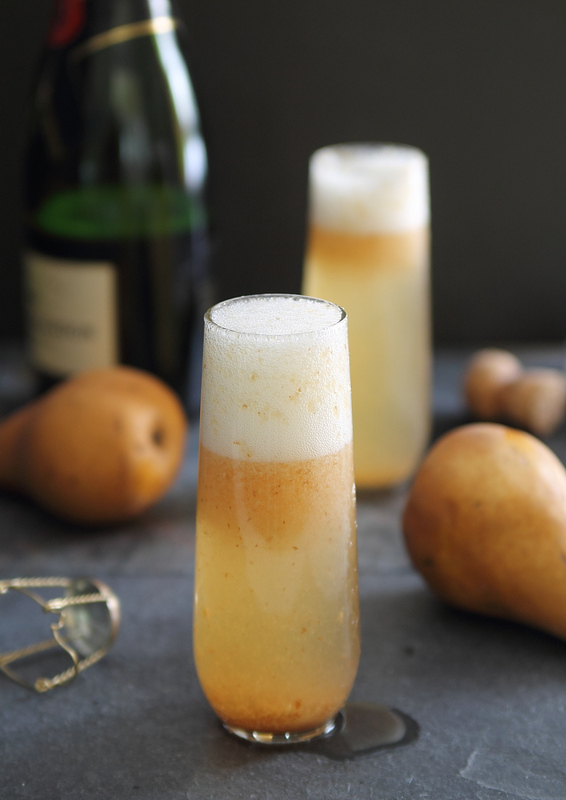 It’s not too late to stock up on Perry from our online shop, or for something a little different, try this Ginger Pear Bellini. Puree pear in a food processor and set aside. Combine the water, sugar and ginger in a small saucepan. Bring to boil and stir until sugar is dissolved. Cover, turn the heat off and let it sit for 30 minutes. Remove ginger pieces, pour the syrup into the pear puree, stir, cover and refrigerate until cold. Once cold, spoon about two tablespoons of the puree mixture into a champagne flute, top with champagne and enjoy!